Combine the cantaloupe and pineapple salsa ingredients in a medium bowl and toss until mixed. Add salt to taste. The salsa can be served at room temperature or refrigerated until ready to use. In a small bowl, add the pepper paste ingredients and blend until the mixture forms a paste. Coat the tuna steaks evenly with the pepper paste. Wrap each steak individually with plastic wrap and refrigerate for 30 minutes. Build a charcoal fire in an outdoor grill and open all dampers for maximum heat. Heat the grill to approximately 500–600°F. Apply a light coat of oil to the hot grill grates. Remove the tuna steaks from the plastic wrap and place on the grill, directly over the heat. Grill for 3 minutes on each side or less depending on how you like them. Tuna should be firm with pink in the middle. 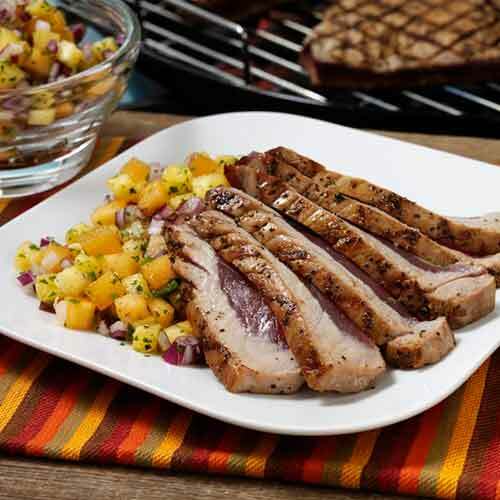 If you prefer your tuna to be rare to medium-rare, grilling time should be reduced to 1½ to 2 minutes per side. To serve, slice the tuna into ¼ inch strips and top with a generous amount of salsa. Apple wood rounds out the fruitiness of the salsa.